Marijuana in the Workplace #infographic ~ Visualistan '+g+"
After reaching a 30-year low in 2012, the current rate of positive drug tests among American workers is down to less than 5%. However as legalization and decriminalization of marijuana moves forward,86% of employers say they are concerned about it making its way into the workplace. Workers who test positive for illegal drugs also have 59% more absences and 47% more terminations than colleagues. Drug-free environments reduce this level of absenteeism, reduce employee turnover, and lower the risk of liability for workplace accidents. Drug tests do little to impact illegal drug use overall, but in the workplace it encourages a productive and safe professional environment. 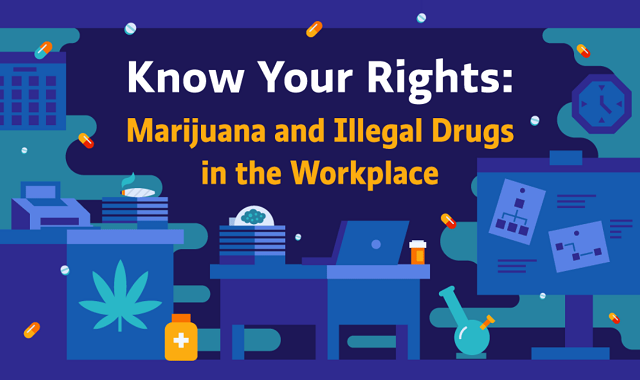 Almost 90% of employers still drug test at some point during an employee’s tenure - do you know your rights? Take a look at this infographic for more on the state of professional drug testing, it’s legal limitations, privacy rights, and why it’s still important.